We analyze the sidereal daily variations observed between 1985 and 2006 at Matsushiro, Japan (MAT) and between 1993 and 2005 at Liapootah, Tasmania (LPT). These stations comprise the two hemisphere network (THN) of underground muon detectors in Japan and Australia. Yearly mean harmonic vectors at MAT and LPT are more or less stable without any significant change in phase and amplitude in correlation with either the solar activityor magnetic-cycles. 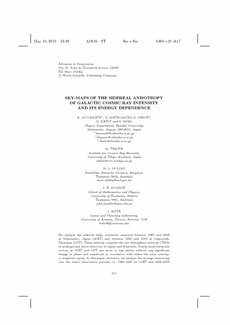 In this paper, therefore, we analyze the average anisotropy over the entire observation periods, i.e. 1985�06 for MAT and 1993�05 for LPT. We apply to the THN data a best-fitting analysis based on a model anisotropy in space identical to that adopted by Amenomori et al.1 for Tibet III data. The median energies of primary cosmic rays recorded are ∼0.5TeV for THN and ∼5TeV for the Tibet III experiment. It is shown that the intensity distribution of the best-fit anisotropy is quite similar to that derived from Tibet III data, regardless of the order of magnitude difference in energies of primary particles. This, together with the THN observations, confirms that the analysis by Amenomori et al.1 based on the Tibet III experiment in the northern hemisphere is not seriously biased. The best-fit amplitudes of the anisotropy, on the other hand, are only one third or less of those reported by the Tibet III experiment, indicating attenuation due to solar modulation. The rigidity dependence of the anisotropy amplitude in the sub-TeV region is consistent with the spectrum reported by Hall et al.,2 smoothly extending to the Tibet III result in the multi-TeV region. The amplitude at higher energies appears almost constant or gradually decreasing with increasing rigidity. The rigidity spectrum indicating the solar modulation also supports the conclusion first implied by the Super Kamiokande deep underground experiment that the large scale anisotropy observed by Tibet III is due to the charged component of primary cosmic rays, and not due to high energy gamma rays to which underground muon detectors have negligible response.